Finding places on a map is an integral part of a GIS. Geocoding is the process of transforming a description of a location—such as a pair of coordinates, an address, or a name of a place—to a location on the earth's surface. 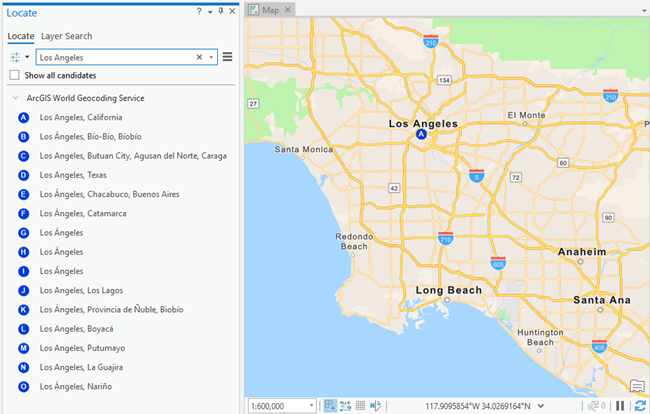 You can geocode by providing one location description at a time to zoom to a location on a map or convert an entire table that can be used for spatial analysis. No specific locators are needed in the project for finding these x,y locations. ArcGIS Pro supports finding these x,y locations using the Locate pane only. Here is some helpful information on how you may enter the x,y coordinates for searching. You can enter the coordinates in longitude-latitude or latitude-longitude order. Remember, x is longitude (east-west), and y is latitude (north-south)—the same order in which coordinates display in the status bar. Spherical coordinates aren't always specified in this order. For example, if someone asks you to plot 17.1325, -60.666 on the map, ask if these coordinates are in longitude-latitude or latitude-longitude order. The way to tell the order from the coordinates is if they contain E, W, N, or S characters to signify the hemisphere. The found candidate indicates if the result is a LongLat point or LatLong point. When you are using decimal degrees (DD), degrees minutes seconds (DMS), or degrees decimal minutes (DM), coordinates can be entered by using a minus sign before the numeric value to signify the western or southern quadrants or by using E, W, N, or S characters before or after the numeric values. Values in DMS and DM coordinates can be separated with spaces; with the °, ', and " special characters (such as when you paste coordinates that you have copied from other dialog boxes or applications that use those characters); or with both. Regardless of whether you use DD, DMS, or DM on the dialog box, coordinates can be entered in any of these three formats and are automatically converted to match your chosen format. When using MGRS or USNG locations, make sure there are no spaces in the coordinate string.